1) The silence. Being alone in your home may be comforting at times, but at other times, the silence can feel uncomfortable. 2) Safety concerns. Even if your partner was ill, there was probably an illusion of protection just because they were around. Having a watchdog can be reassuring. 3) Companionship. In addition to providing unconditional love, a pet can be a great listener. Research has shown that pets can help increase the health and quality of life of their owners. “Therapy Pets” are used to enhance the recovery process of patients and the disabled. Learn more. If you’re new to pet ownership, ask a pet owner you know for advice and referrals to local veterinarians. Before considering bringing any pet into your life, consider not only your needs, but also your physical capabilities. While a dog provides a greater sense of safety, they do require daily walks and exercise. Cats are generally lower maintenance. Do some research into the characteristics of different breeds so you can choose a pet best suited to your own lifestyle. Whatever you decide, also consider getting a rescue animal. Whether you've lost your spouse/partner or care about someone who has, this is a place to find support and share your experiences with others in the same situation. New to blogs and want to add your response? Click onto "Comments" at the bottom of any post. NOW GET A 20% PUBLISHER'S DISCOUNT! Order your copy of Lost My Partner directly from our blog and get 20% off the cover price of either edition! The contents of this site are for informational and/or educational purposes only. The material provided on this site is not to be used as a substitute for professional psychological, psychiatric or medical advice, diagnosis or treatment. If you have any questions or concerns regarding a psychological or medical issue or problem, always seek the advice of a physician and/or psychiatrist or a qualified mental health professional. If you are having thoughts about suicide or doing harm to others, seek immediate professional help by calling your local suicide hotline (your telephone operator can connect you), or by contacting the National Suicide Hotline either by phone (1-800-273-8255), or online at: suicidepreventionhelpline.org. No theraputic relationship is constituted by the use of this site. Any advice or information is provided on an "as-is" basis. Any reliance on any advice or information provided by Ruth Webster, M.S.W. and/or Laurie J. Spector, M.S.W. or any other person or professional on this site is solely at your own risk. 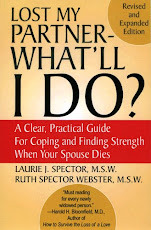 Ruth Webster, Laurie J. Spector, lostmypartnerblog.com, and McCormick Press make no representations as to accuracy, completeness, suitability, or validity of any information on this site and will not be liable for any errors, omissions, or delays in this information or any losses, injuries, or damages arising from its display or use. The owners of this site are not responsible for the content of any linked sites. Copyright 2018, by Ruth Webster, M.S.W. and Laurie J. Spector, M.S.W. All rights and all media reserved.